One of the last activities to take place in S5B is the filling of the Herschel cryostat with liquid helium and its conversion into superfluid helium-II. The primary objective of achieving a full cryostat, above 95%, with a helium temperature below 1.7 Kelvin was reached on Friday 25 April and the activities now focus on maintaining the good helium conditions until the spacecraft can be moved to the Final Assembly Building (BAF) for integration with the launcher. View of the cylindrical cryostat vacuum vessel during testing of the spacecraft in June 2008. In order to study the coolest places in the Universe the Herschel instruments must be cooled to just above absolute zero. 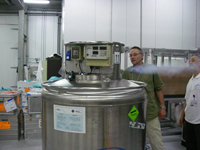 A large cryostat surrounds the instruments maintaining an operational temperature of 1.7 K for a nominal mission lifetime of 4 years. At the time of launch the cryostat tank in the Herschel spacecraft will contain about 2300 litres of superfluid helium-II. Getting to that stage is a lengthy process that began even before the launch campaign was underway. 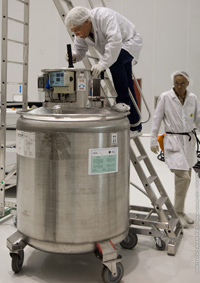 For the Herschel-Planck launch campaign, ESA procured the helium required for both spacecraft via Arianespace from AirLiquide who in turn procure large quantities of liquid helium for the Ariane 5 launcher. This helium is supplied, normally from the United States, in large cryogenically cooled and vacuum insulated containers each containing about 30 000 litres of liquid helium. These containers are brought to French Guiana on commercial boats and driven to the AirLiquide plant at the Centre Spatial Guyanais (CSG) premises in Kourou, French Guiana. One of these containers has been reserved for the Herschel launch campaign helium activities. The arrival at CSG is just the beginning of a lengthy process that will result in the Herschel cryostat being filled with superfluid helium-II at the time of launch. The helium, still in liquid form at ambient pressure and at about -269 degrees Celsius (4.2 Kelvin) is transferred to smaller dewars that have a capacity of about 450 litres when full. 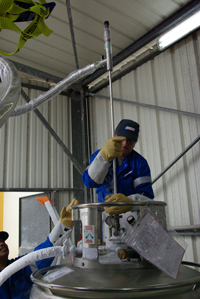 Transfer of liquid helium from a large container (seen at top left, with the transfer line attached) to the dewars. The transfer is performed using vacuum insulated lines to ensure that a minimum of heat energy is transferred into the liquid and to ensure the external surfaces do not ice up. If unprotected, the humidity in the air would immediately turn into ice, and even the air coming into contact with the surface would turn into liquid or ice. Once filled, the dewars are brought to the building where they are used (S1B, S5B or BAF) and inspected for visual contamination in the helium before the helium is transferred into the cryostat. The Herschel preparation activities have been performed with the helium inside the cryostat in helium-I condition, that is, the helium in the cryostat is in liquid form and slowly boiling off at ambient pressure at 4.2 Kelvin. These conditions are used for the final preparations in the S1B building and during the period of hydrazine fuel loading of Herschel in S5B. 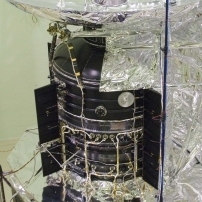 The Herschel spacecraft in the S5B cleanroom is surrounded by platforms that are used for the helium filling activities (20 April 2009). Left: The dewars are inspected prior to use (20 April 2009). Above: Condensation on the dewar (20 April 2009). Once the hydrazine fuelling is completed, the helium in the cryostat is brought to what is known as helium-II conditions by the use of vacuum pumping for several days. This process lowers the temperature of the remaining helium in the cryostat tank below the Lambda point, (the temperature at which liquid helium, helium-I, transitions to superfluid helium-II), at about 2.17 Kelvin and the temperature will be lowered even further by continued vacuum pumping to about 1.7 Kelvin. 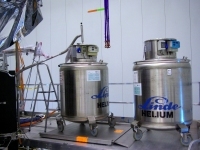 About half of the helium will evaporate by this process so the cryostat will continue to be refilled with additional helium (even after the spacecraft has been moved to the BAF) and the vacuum pumping will continue up until four days before the launch, at which stage the cryostat tank will be closed off with a valve and the helium-II activities finished. At this point in time the tank will be about 95% to 98% full and at a temperature of about 1.7 Kelvin. When the helium-II activities are finished the launcher fairing will then be placed over the Herschel and Planck spacecraft and access is only possible through small access doors placed in the fairing. These access points will be used to ensure the cryostat tank itself is kept as cold as possible for the following days by flushing helium gas through some of the internal parts of the cryostat until the day before the rollout from the BAF building to the launch pad when the access doors will be closed. From that point onwards there is only the possibility to launch on the nominal launch day or the following day before it is necessary to bring the launcher back to the BAF, remove the fairing and repeat parts of the helium pumping and replenishing activities.